Peak Health Announces Filing of Patent Applications for testing the "Bioactivity" of the Cannabidiol (CBD) molecule and publication of scientific paper documenting results of commercial samples. Independent laboratory established to test the bioactivity of commercial Cannabidiol. Miniature field test kits to be available in September 2018. A test kit that comprises of the anti-Cannabidiol antibody. Journal of Medical Phyto Research ISSN: 2577-6541 Vol. 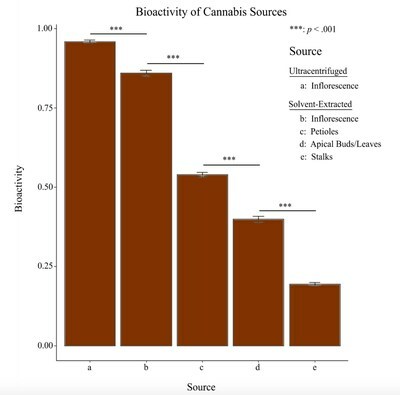 1, Article 2, (8-23) Doi: 10.31013/1002b "Measuring the bioactivity of phytocannabinoid cannabidiol from cannabis sources, and a novel non-cannabis source." The "Bioactivity" of the Cannabidiol (CBD) molecule, or any drug, is a complex interplay between its binding efficiency to a receptor, and its ability to produce a biological response— of quantitative magnitude. The announced CBD Bioactivity Test precisely measures the ability of a CBD sample to bind and produce an immunological response via the CB2 receptor. "CBD is a source of many medical claims and the market has seen an explosion of CBD products. Consumers are paying premium prices for these products. They are completely ignorant of the fact that CBD is a biological molecule with 400% variation between batches. And worse, most of the products we have analyzed have very poor bioactivity. Making any medical claims on this is highly tenuous," says Donish Cushing, one of the authors of a scientific paper published today. "All research papers published about CBD, from plant sources, have not accounted for variations in their bioactivity. I believe this has confounded research and produced inconsistent results so far. The inflorescence of the plant produces the best bioactivity. The stalks and stems the worst. Current regulations dictate that only stalks/stems can be used to manufacture CBD. Thus assuring the worst quality product. 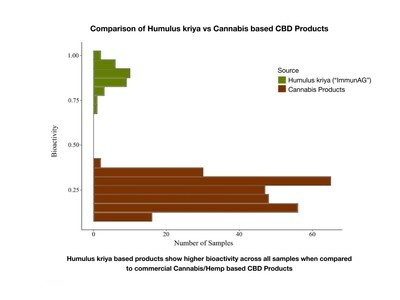 This inconsistency needs to be resolved by lawmakers," said Dr. Sharma Kristipati, Director of the newly set up lab to measure CBD Bioactivity. "Governments are considering certifying CBD as an Active Pharmaceutical Ingredient (API). The products we have measured vary from 11% to 41% in Bioactivity. Too poor and too much variation. Governments should only certify CBD, as an API, if it has a Bioactivity greater than 80%," further added Dr. Sharma Kristipati. Samples of CBD can be tested from June 2nd 2018 at www.BioactiveCBD.org or by calling (844) 960-7325. The price for testing a sample is $125 and the price of a portable field test kit is expected to be $5,300-$5,500. Is a 501(c)(3), Not-For-Profit Corporation, based out of Los Gatos, CA. It's charter is to improve human health, with the least use of pharmaceutical drugs. It's researchers from around the globe are volunteering efforts to enhance our knowledge of endogenous health and Phytotherapy.